Nicole Mitchell’s push to make her son succeed in school has honed the rookie’s mind and helped him develop faster in the NBA. 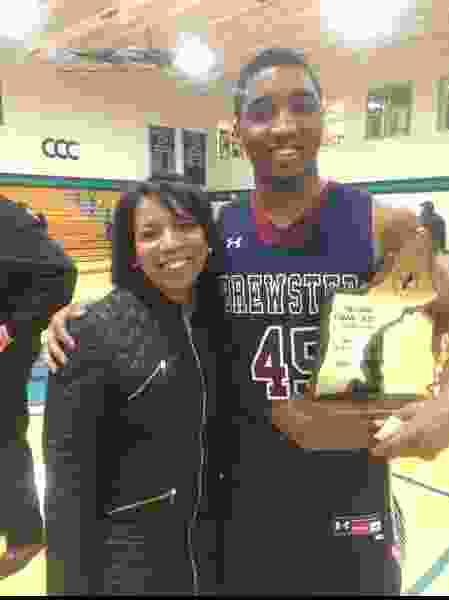 Donovan Mitchell poses with his mother, Nicole Mitchell, and a basketball conference championship he won at Brewster Academy as a senior in 2015. Mitchell won two prep national championships at Brewster and was class prefect. Courtesy of Nicole Mitchell. The story has been etched into Donovan Mitchell’s mythos: After a workout with then-Clippers guard Chris Paul, the nine-time All-Star told the Louisville star that he should declare for the NBA draft. Nicole Mitchell, Donovan’s mother, was less easily swayed. Even though she’s watched her son play in hundreds of games by now, she doesn’t claim to be an expert on the NBA draft. But she is an expert on education, and she did research as Donovan weighed his decision. Even when she came to agree going pro was the right move, she had conditions. Even as some teammates have snickered at his offseason ambitions, Mitchell is enrolling in online classes at the University of Louisville this summer. With more than two years’ worth of college credits, he’s going to chip away at his degree. At 21, Mitchell is making $2.6 million this season as a rookie, but he is also the kind of player who most basketball observers expect to sign a max contract worth hundreds of millions of dollars within the next four years. What can a college degree get him that basketball cannot? Part of it is he expected to go back to school last spring, and he liked it at Louisville. Part of it is he wants to be a broadcaster someday, and formal training will help. Part of it is he sees a degree as something permanent that never can be taken away. One more thing that keeps him in this pursuit: He promised his mom he’d do it. With everything she’s done for him and pushed him to do, it’s a promise he has to keep. The story begins in a hallway Nicole Mitchell didn’t really belong in. Nicole worked in the New York public school system as an accounts payable clerk before Donovan was born. She always was good with numbers, and it had led her to college, a career in banking, then doing books for schools. But the more time she spent in the building, the more she was drawn to the corridors. Doing the numbers was her job. But teaching — that was exciting. Nicole’s parents were Panamanian immigrants, and they wanted the best for her and her two siblings when they moved to Westchester, N.Y., from Brooklyn. It wasn’t until college that Nicole realized she was missing things she didn’t know she needed. Other students were used to the structure of formal education, and they knew how to deal with professors, balance assignments and make the experience work for them. Nicole felt she had to work twice as hard to get the same grades. Nicole became determined through those experiences to give her children every possible advantage. Donovan and his sister, Jordan, both attended Greenwich Country Day, which carries a tuition of $37,000 or more per student. They both went to boarding school at Brewster Academy, which lists its tuition at $62,600 per student for the next school year. Scholarships helped mitigate some of that expense, but the Mitchells still wrote checks — gladly. Throughout Donovan’s and Jordan’s time at Greenwich, Nicole, who teaches preschool there, conferenced with their teachers to check in on their grades. Back then, they didn’t understand how she had such a hawk-like sense of when they were coming home with a bad mark. When Donovan started showing signs he was interested in following his father’s footsteps as a professional athlete (Donovan Mitchell Sr. was a minor league baseball player who still works for the New York Mets), Nicole doubled down — How will he manage his money? How will he know how to navigate contracts and business dealings? How will he know information people tell him can be trusted without doing his own research? It wasn’t easy to get Donovan to invest. He doesn’t remember the assignment or the class. Donovan remembers the anger. He was in the eighth grade, a budding star and a key player on his AAU team, The City. They were about to play a big tournament in Pittsburgh — but Donovan was not. Donovan had been assigned to memorize an address for public speaking. The deal was if he memorized it by Saturday morning, Nicole would drive him to the tournament. If not, he wasn’t going. Nicole was as good as her word. While her son tried to plead and bargain that he would memorize the speech on the trip, parents, coaches and even the owner of the AAU team called. They would help him with his homework, they said. The other kids needed Donovan and would lose without him, they said. Nicole was stoic as she told every caller that her son was staying home. It was only afterward, sheltered in her bathroom, that she allowed herself to cry. There was a consistent message throughout Donovan’s childhood: Sports can be taken away. Education is the priority. Donovan wasn’t the only one Nicole had to convince. Donovan Mitchell, No. 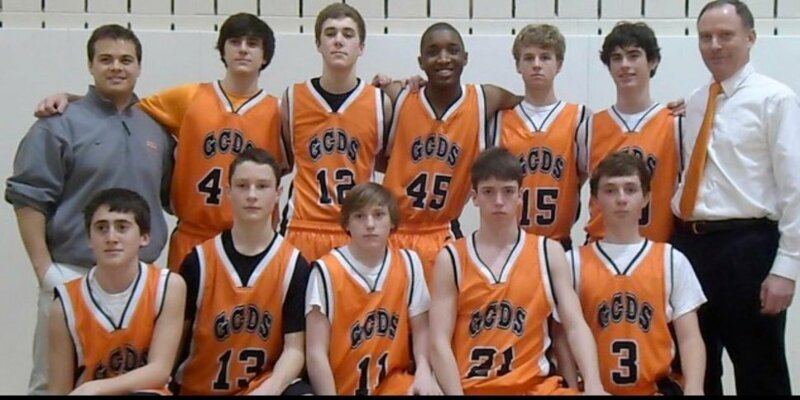 45, poses with his 9th grade basketball team at Greenwich Country Day School. Mitchell attended the Connecticut private school between 3rd and 9th grade. Courtesy of Nicole Mitchell. When Nicole moved her children to Greenwich Country Day, she heard endless criticism. Friends, family and basketball evaluators thought Donovan could be an athletic star, and preferred he take the more accepted route of going to Catholic schools in Westchester, closer to the city. In the end, Donovan got the private school education Nicole wanted, and he also starred on his AAU team. When Donovan transferred schools again, Nicole got what she wanted out of the deal — an education at Brewster Academy — and Mitchell got to play for an elite basketball program. He suited up and studied at stuffy, predominantly white schools during the week, and he was allowed to cut loose with the friends he had grown up with on the weekends. It was at Brewster where Donovan began to find his footing. Brewster would send Nicole updates on his grades every week, accompanied by reflective notes written by Donovan. Nicole had feared the worst, that without her watching over him, he would crash. But to her surprise, it started to click. Donovan was more than a star athlete who won two prep national championships at Brewster. He played drums in the school band and sang in the choir. He had a duet in a school production of Oliver!. He was class prefect as a senior, the Brewster equivalent to class president, and he gave campus tours. What Donovan began to understand was not every one of the players he had grown up knowing could say the same. Some once-promising prospects he knew who had gone the more accepted route fell off. From his 6-foot-10 wingspan to his 40-inch vertical leap, Mitchell has physical gifts that set him apart from other rookies. But as important as those traits is his mind. When Mitchell joined the Jazz at summer league, coach Quin Snyder noticed he was over-reliant on a certain move: a left-side drive, followed by a right-side spin. In July, the Utah coaching staff assembled a 12-part video of players finishing with moves: jumping off the right foot and finishing with the left hand; jumping off the left foot and finishing with a floater; etc. The video was intended to be something Mitchell worked on throughout his rookie season, something the staff would revisit when they had time to develop him. But he had one move down by August. Another by September. The pace at which he has added moves continues to surprise his coaches. That development is not borne out of diligent study. Snyder has said he has tried to not put too much on his star rookie’s plate, but Mitchell always seems to be ready to ask for more. Privately, he thinks of film study in the way he used to think of homework at Brewster. Mitchell has won Western Conference rookie of the month three times in a row while leading all rookies in scoring (20 point per game), making NBA talent evaluators question how they couldn’t have seen Mitchell coming. Even the Jazz acknowledge they didn’t envision the success Mitchell has had so far. But while many coaches have said this season they thought he nailed his workouts and interviews with their teams, it’s possible the Jazz simply valued some of those traits more. As a franchise that stakes its reputation on player development, they saw a player they believed could get better. There’s something of an urban legend about Mitchell’s Jazz workout last spring. Afterward, general manager Dennis Lindsey told his staff (somewhat threateningly, according to more colorful accounts) to not say a word to anyone about what they had seen. Lindsey recently confirmed he swore people in the organization to silence, because what they saw was Mitchell had developed much faster than expected since the end of his Louisville career two months earlier. The rest of the story is known: Mitchell fell to 13th, and the Jazz were able to make the trade they wanted. Even Lindsey is willing to say Mitchell has outperformed expectations. The characteristic that has most impressed the Jazz is what made Mitchell his class prefect at Brewster. He has a charisma and a social adaptability that has allowed him to fit in seamlessly with the locker room. He’s talkative, possesses a sharp wit and is outgoing. He knows when to crack jokes, but also when to cede the floor. Even as Joe Ingles and Rudy Gobert tease that a massive rookie prank is on its way for Mitchell, it’s telling that they haven’t gotten around to it yet. No matter how quickly Mitchell finishes at Louisville, he’ll be playing catch-up. Nicole is living her own advice, finishing her master’s degree in education. If postseason plans allow, Donovan will be one of her proudest supporters at her graduation in May. With her business and education backgrounds, Nicole wants to open her own school someday. She wants to help students who have the disadvantages she had to reach opportunities that her children did. Athletic gifts aside, Nicole never will stop believing that in her push to give her son the best possible education, she helped propel him toward the success he has found, on the court and off. Donovan believes that, too. But there’s something even more important he’s taken away from his education. He’s not doing it so he can go to a tournament anymore. He’s not doing it to make his mom happy.